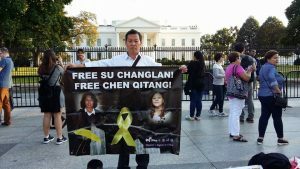 On October 17, 2016, Zhuang Liehong, former Wukan Village Autonomy Committee Member, and Yao Cheng, Mainland Project Leader of Women’s Rights in China (WRIC) came to Washington DC seeking attentions on the Human Rights crisis in Wukan Village. Three seminars were conducted in three different departments: The Bureau of Democracy, Human Rights, & Labor in US Department of State, The National Endowment for Democracy (NED), and The Congress – China issue related departments. During these meetings, detailed accounts of the turmoil and current decline of Human Rights in Wukan was discussed. Villager Mr. Zhuang explained that beginning in 2011, government officials confiscated land from the villagers and sold it to real estate developers without permission or proper compensation. Villagers petitioned, but got no response. Eventually protests ensued, forcing out local authorities and forming the Wukan Village Autonomy Committee. Since then, this small fishing village has been under constant scrutiny and suppressions. In 2012 and 2016, it suffered two large-scale armed crackdowns by the government authorities. Zhuang said, “Wukan village is currently in a total blockade, like a big prison.” Streets are swarmed with armed police officers and plainclothes. Anyone comes in and out of the village has to go through security and almost no outsiders are able to enter Wukan. The villagers have no farmland to cultivate and no business patronized. Some families are in poverty, living on food and money sent by their friends and relatives. Networks are totally blocked not only in Wukan, but also several nearby villages. More than 70 people are arrested and their whereabouts unknown. During the armed crackdown on Sept 13th, an eighty-year-old woman was shot and her life is still uncertain; a woman was beaten and injured her spine will suffer a life-long paralysis; more than 100 people injured in the crackdown are not getting treatment from the government and cannot afford it themselves. Living in this free nation, being the only Wukan villager that can speak up, Zhuang said that he still gets threat from the Chinese government. Zhuang was choked by personnel at the Chinese Consulate in New York, while trying to submit a petition letter to Premier Li Keqiang, during the United Nations General Assembly. The Chinese police even called Zhuang to warn him from any further activism, threatening him with his father in Chinese detention center. 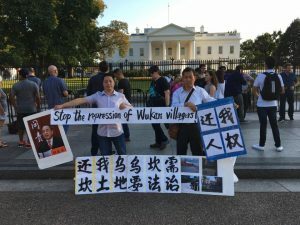 Zhuang called on the US government, Congress and the international community to concern about the Wukan villagers and the Human Rights crisis in Wukan; to pressure Chinese government on releasing the arrested protesters, giving injured villagers free treatment, withdrawing the riot police, restoring the network, and returning lands to the villagers, so that villagers can live no longer under fear. Mr. Yao Cheng stressed in his speech that as the first and only village forced out the Chinese Communist Party (CCP) leadership, and elected their own leadership committee, Wukan not only set an example for land right activism, but also made a historical breakthrough on democratic election under the rule of CCP in mainland China. The two major armed crackdowns were essentially a serious violation of democracy, human rights and universal values. Yao Cheng agreed with Zhuang Liehong on locking down Hu Chunhua, Secretary of the Guangdong Provincial Party Committee, as the main responsibility person of the second main suppression (2016). He also addressed that the previous secretary Wang Yang was no better. The reason he compromised on the legitimacy of Wukan Autonomous Committee, at the first suppression (2012), was only because over 100 foreign reporters from stayed in the village at that time. It is proved that the compromise of Wang Yang was just a delaying tactic. This time when Hu Chunhua moved troops from Huizhou to suppress the riot in Wukan, his main attention was to get his way in the 19th National Congress of the CCP. The troop captured the Committee leaders in the middle of the night, cut the networks and cut the foreign media from coming in the village. When the riot broke out, Hu commanded the police to use rubber bullets, tear gas, and even a more powerful blast bomb, leaving several villagers with bloody backs and faces. During the seminar, Yao Cheng introduced the non-government organization WRIC, and its human right projects in mainland China. He said that after the outbreak of Wukan protests in 2011, Su Changlan and Chen Qitang, WRIC members in Guangdong timely followed up with the status in the village. They were found and restricted by the local police when they tried to enter the village. Under such situation, Yao was sent into Wukan by WRIC, where he witnessed thrilling scenes. After the Wukan protests, Xi government strengthened supervision and suppression on NGOs, and arrested another four WRIC members while Su and Chen were remaining under detention. WRIC is very concerned of Wukan protests because women were the group of people injured most in the suppression. Majority of men in Wukan village (population 13,000) work outside of the village, leaving the village with mostly elderly, women and children residents. During the armed crackdown, women had to be the main force to fight back and protect their family. Yao Cheng met Zhuang Liehong in New York. When the second crackdown happened on Sept. 13th this year, WRIC committed to assist Zhuang Liehong on submitting an open letter to the UN, and petitioning to Chinese Premier Li Keqiang during his attendance at the UN General Assembly. Zhang Jing, founder of the WRIC gave advice on the petition and contacted media. Yao Cheng accompanied Mr. Zhuang for four consecutive days walking around Warldorf Hotel and the Chinese Consulate General in New York seeking opportunities to get contact with Li Keqiang. On October 4th at the seminar held by NYU discussing Wukan related issues, Yao introduced the current condition in Wukan. 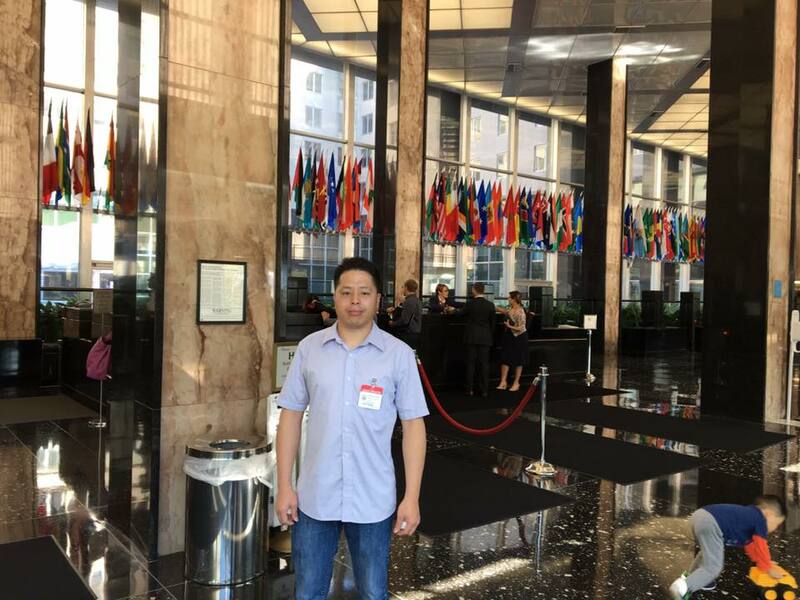 Today, he again accompanied Mr. Zhuang to Washington DC to join discussions with the US government and Congress on the Wukan issue. Yao Cheng hopes that the US can put some pressure on Chinese government to release the arrested villagers and other NGO members, give back villagers their farmland, and give back the villager a normal peaceful life. He believed that only under the international attention and pressures that can Wukan situation is likely to be improved. YYao Cheng also called for the release of WRIC’s volunteers Su, Changlan, Chen,Qitang. 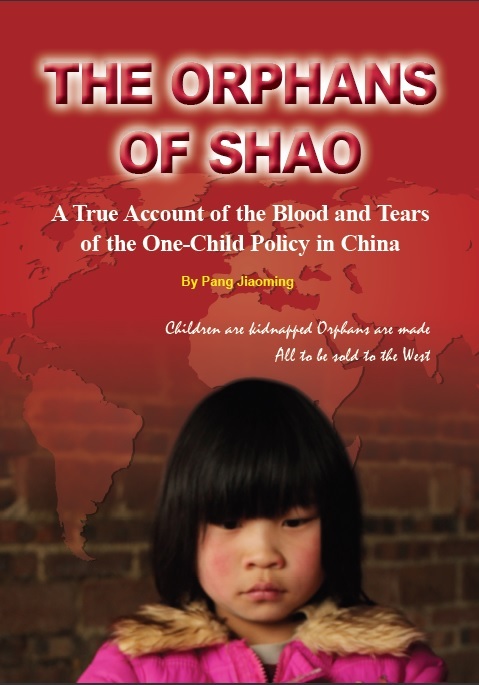 How could the Chinese government do this? It is an eye-opener for me to read this information in which the Chinese government is probably most likely hid it from its own people. Thank you activists for showing the rest of world about all of this!